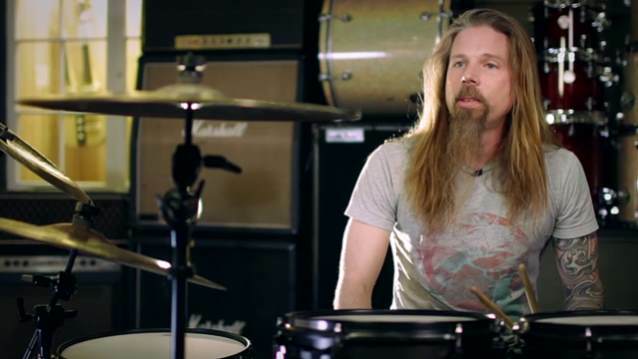 Drummer Chris Adler of Richmond, Virginia metallers LAMB OF GOD visited the Hollywood Guitar Center Vintage Room to talk about his musical beginnings and what drumming does for him on a professional and personal level. Check out the clip below. In 2011, Chris Adler released a comprehensive, behind-the-scenes narrative book, detailing the early days of LAMB OF GOD through the writing and recording of the band's "New American Gospel" album. This is the first and only book chronicling the history of the making of this classic LP. Known for not pulling any punches, Adler tells the real story, warts and all. Over 100 oversized pages personally written by Chris Adler, the book also includes drum tablature, transcribed and verified by Adler himself. Along with refreshingly accurate drum tabs per song, Adler precedes each song on the album with pages of written detail on how and why "New American Gospel" came to be, and his view of how it worked, or didn't, in the band's live set. As many players know, many tablature books contain incorrect information due to publishers not verifying with the artists. By self-publishing, writing and transcribing, Adler has made sure that the common mistakes do not exist. The tablatures are all transcribed and verified by master technician Travis Orbin and Adler himself, and are designed to provide accurate insight into the drumming on the album as well as a convenient learning and teaching tool to teachers and drummers alike. The production of the book is completely self-financed, written (no ghost writers), and published by Adler to have total product quality control. The book is a must-have for any fans of LAMB OF GOD or Adler's drumming, as well as fans looking for "fly-on-the-wall" access to how and why critical choices and decisions were made in the process of creating "New American Gospel". Throughout the narrative, Adler speaks frankly of his drumming, the successes, the failures, and obstacles that ultimately led to him contemplating leaving the band years ago. To purchase the book, visit www.chris-adler.com. Fans should be sure to head to Chris Adler's brand new web site to catch up on first-hand information, endorsements, and appearances. The site also includes a small store of exclusive items used by Adler.